One of the most controversial raids of the Second World War was the raid on Dieppe, which took place on 19 August 1942. By the end of the day, thousands of Allies were dead, wounded or taken as prisoners of war. The Dieppe Raid has since been the subject of much debate, but within the overall operation there were countless acts of great bravery, including those of British commandos at two mighty gun batteries that simply had to be silenced. The origins of the Dieppe raid were to ease the pressure on the Eastern Front and prevent Germany from committing more resources to the east. The Americans and Russians had both urged Britain to open a second front, but Britain, already heavily engaged in North Africa, the Mediterranean and the Far East, did not have the resources to conduct and sustain a large-scale offensive in north-west Europe. Nonetheless, Winston Churchill had made it clear that he wanted to conduct a major operation during the summer of 1942. Senior military commanders agreed. If the Allies were to eventually carry out a full-scale invasion of mainland Europe, it was essential for a division-size operation to be carried out against a German-held port on the northern coastline of France. To do so would not only help gain a better understanding of large-scale amphibious landings, but would also determine whether the Allies were capable of maintaining forces ashore once a landing had taken place. A number of ports were considered, but while most were rejected for one reason or another, Dieppe was accepted as a possible target. A coastal town built along a cliff overlooking the English Channel, it was a relatively short distance for raiding forces and so it was possible to make the crossing under the cover of night. Dieppe was also within range of RAF Fighter Command and so raiding forces could be given significant cover from the air. In April 1942, Mountbatten gave the order for his staff at Combined Operations to commence planning for the raid, which was to be supported by a large array of naval and air assets. 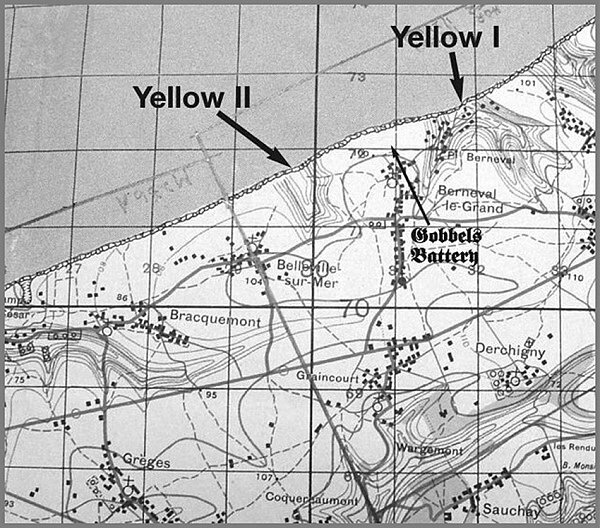 One option drawn up was to land a mix of tanks and infantry either side of Dieppe and to then capture the town using a pincer movement over the two headlands flanking the port. Another option was to land tanks and infantry directly onto the beach at Dieppe in a frontal assault, supported by landings on either side of the town. 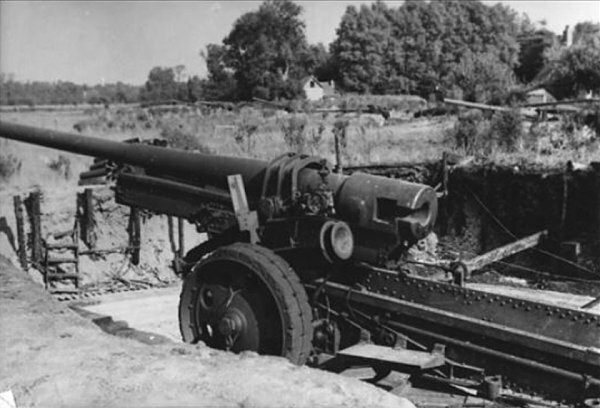 Two heavy artillery gun batteries protecting the approaches to Dieppe – the Hess Battery at Varengeville to the west and the Goebbels Battery at Berneval-le-Grand to the east – would be captured by airborne troops landing ahead of the main attack. After much discussion it was decided to proceed with the second option, the frontal assault, which would be preceded by a heavy aerial bombardment. Codenamed Operation Rutter, the attack was planned for early July when tidal conditions would be just right for the assault. It would test the feasibility of capturing a port in the face of opposition, understand the problems of operating the invasion fleet, and test the equipment and techniques of the assault. The scale of the operation meant there were insufficient resources amongst the British Army’s commando units to carry out the raid. Therefore, regular army troops would need to be involved, and because there had been increasing pressure from the Canadian government for its troops to take part in operations, the Canadian 2nd Infantry Division was selected as the main attacking force. Intelligence reports suggested that Dieppe was not heavily defended and the beaches were suitable for the landings. The plan was for two Canadian battalions to assault the main beach, supported by Canadian tanks and engineers, after two other Canadian battalions had landed earlier to attack German gun batteries overlooking the main beach. The British 1st Battalion of the Parachute Brigade were to be dropped to attack the two coastal batteries at Varengeville and Berneval-le-Grand, with a further Canadian battalion acting as a reserve to be committed when and where necessary. The date for Rutter was narrowed down to the first week of July but, after weeks of training, the combination of unsettled weather and the fact the Germans had spotted and attacked the large gathering of ships required to transport the assault troops across the Channel, resulted in the operation being cancelled. Although Rutter had been cancelled, its planning was not entirely wasted. The decision to remount the raid, this time called Operation Jubilee, meant plans were resurrected. The main objectives remained largely unchanged, with the only difference being that the large German coastal batteries would be attacked and captured by a seaborne assault, rather than from the air: 4 Commando was tasked to destroy the Hess Battery at Varengeville while 3 Commando was to destroy the Goebbels Battery at Berneval-le-Grand. Along stretches of the south coast of England the commandos began training for the raid. They would be required to assault the two coastal gun batteries at dawn while the main landings took place on five different beaches along a 10-mile stretch of the coast. A total of 5,000 Canadians and a further 1,000 British troops, including the army commandos and a unit of Royal Marine commandos, and 50 American Rangers were to be supported by more than 230 Royal Navy ships and landing craft and nearly 70 RAF squadrons. It would be the largest amphibious raid of the war. Tasked with capturing and then destroying the Goebbels Battery, codenamed Operation Flodden, 3 Commando was to be led by Lieutenant Colonel John Durnford-Slater, who had led his men in the raid at Vaagso the year before. His plan was for his force of just over four hundred men to land in two groups on two beaches, codenamed Yellow-One and Yellow-Two, either side of the battery and near the village of Berneval-le-Grand. The Goebbels Battery was known to house three 170mm and four 105mm guns and, situated half a mile inland, it was protected from the sea by steep cliffs. Durnford-Slater would lead the main element ashore on Yellow-One while his second-in-command, Major Peter Young, another veteran of Norway, would land with two troops plus a mortar section on Yellow-Two. The two groups would then carry out a co-ordinated pincer attack against the battery using gullies to conceal their position. Meanwhile, 4 Commando, led by Lieutenant Colonel Simon Fraser, the fifteenth holder of the title Lord Lovat, who had also served in Norway, would be carrying out an assault on the Hess Battery under Operation Cauldron. 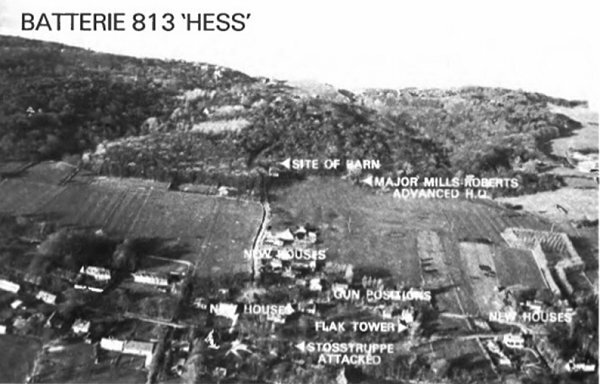 The Hess Battery consisted of six 150mm guns in a concrete emplacement just over half a mile inland from the coastal cliffs. Intelligence reports had estimated there were around two hundred men at the battery, with a further two infantry companies in support nearby. The emplacement was surrounded by concrete defences, landmines, concealed defensive machine-gun posts and layers of barbed wire, and was also protected from air attack by an anti-aircraft gun emplacement. With less than three hundred men, Lovat had a smaller force than Durnford-Slater but he also decided to land his force on two beaches. One group, consisting of C Troop and one section of A Troop, plus a mortar detachment, would be led by his second-in-command, Major Derek Mills-Roberts, and land on the beach at Varengeville. The beach Mills-Roberts had been allocated, codenamed Orange-One, was overlooked by a cliff, but offered two gullies leading to the top, although these were known to be full of barbed wire and other obstructions. The commandos were to scale the cliff in front of the battery and take up a holding position in a wood, half a mile inland, ready to mount a continuous barrage of fire against the front of the battery while the second group, led by Lovat, carried out the assault on the battery. His group, consisting of B and F Troops, was to land on the beach at Quiberville, called Orange-Two. The beach was just over a mile to the west and at the mouth of the small River Saane. It was further away from the battery but the commandos were expected to move quickly inland along the river and then eastwards to the top of the cliffs, where they could attack the battery and its garrison from the rear, although this line of approach was known to be protected by machine-gun posts and barbed wire. The remaining section of A Troop was to be held as a mobile reserve between the two beaches and used as required. Once the battery had been destroyed, the commandos would withdraw using the landing craft at Orange-One. Having left their temporary bases in Sussex and Dorset, the commandos were transported to their embarkation ports for crossing the Channel; 3 Commando at Newhaven and 4 Commando at Southampton. While 4 Commando’s crossing passed uneventfully, the same was not true for the men of 3 Commando. Shortly before 4.00 am, and still about an hour from the coast of France, their landing group was illuminated after being spotted by an armed German convoy in the Channel. The commandos immediately came under intense fire. Their landing craft quickly scattered as they came under attack by fast German S-boats that had been escorting a German tanker. Some of the landing craft were forced to turn back, while others were sunk, effectively halting 3 Commando’s main attacking force. They had simply been in the wrong place at the wrong time and had been unfortunate to have been spotted. Remarkably, though, not all of the landing craft of this group had been sunk or had turned back. Six managed to regroup and continued towards their landing beach. Furthermore, the chance encounter mid-Channel seems to have gone unreported to the coastal defences. To the crews of the German patrol boats, they assumed they had come across a planned raid against their convoy and nothing more. The landing craft of Peter Young had also survived intact and completed the crossing on its own. 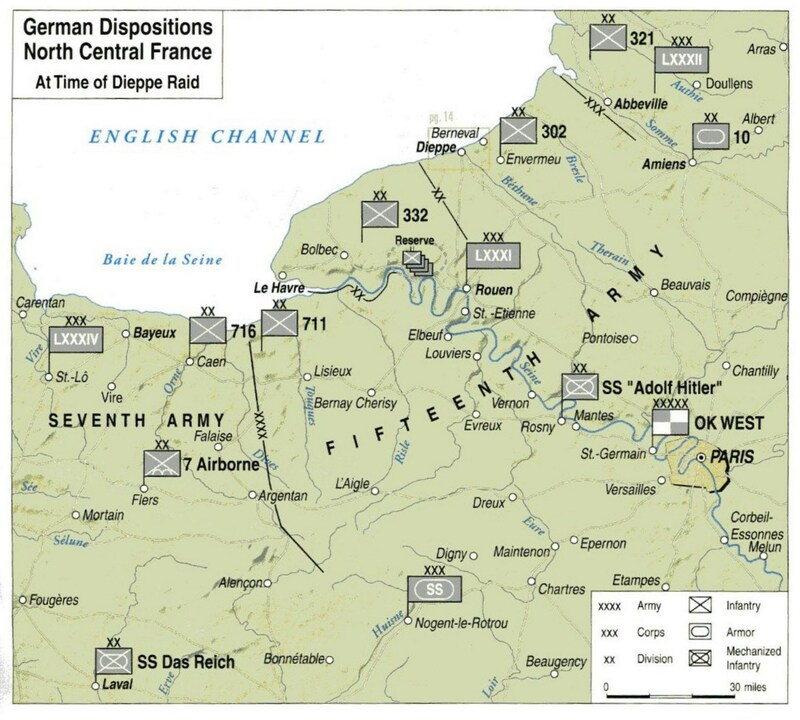 Determined to press on with the attack, the commandos landed just to the west of Yellow-Two slightly before 6.00 am. Making their way quickly across the beach, Young then located a gulley leading to the top of the cliffs. Undeterred by the barbed wire and other obstructions that filled the gulley, the commandos reached the top. The Goebbels Battery was already firing on the main landing force, now just a few miles away, but with only eighteen men there was little Young could do. The commandos managed to reach a position within 200 yards of the battery, but a full frontal assault was clearly out of the question; it would have meant certain death. Young decided the best they could do was to harass the battery as much as possible and to prevent it from inflicting serious damage on the attacking forces. Splitting his men into three small groups, he directed his commandos to cut telephone wires to disrupt communications and continue to fire on the battery for several hours as a constant distraction to the gunners. This seemed to have some effect as no Allied forces were believed to have been lost to the battery. After a couple of hours and hopelessly outnumbered, as well as being all but out of ammunition, Young finally gave the order to withdraw; all his men would make it off the beach and safely back to England. Meanwhile, the group of six other landing craft that had survived the encounter mid-Channel, a total of around a hundred men, including a handful of US Rangers, had landed on a beach to the east of Yellow-One and opposite Le Petit Berneval. But it was now 5.30 am and they were half an hour behind schedule. The delay of thirty minutes had made all the difference between darkness and first daylight, and the landing craft had been spotted by the German defences. As enemy rounds clattered against the landing craft, causing a number of casualties on board, the commandos were quick to get ashore and reach the safety of a nearby gulley. Having then scrambled to the top, Captain Geoff Osmond had contemplated making a limited assault on the battery as planned, but German reinforcements had already arrived in the area. With such a small force it would have been a suicidal attack but the commandos did manage to take out German defensive positions at Le Petit Berneval. However, as they made their way towards the battery the commandos came under a devastating attack and casualties started to mount. The survivors of 3 Commando had now been ashore for just over an hour but any hope of continuing the attack was abandoned. The order was given to withdraw to the beach and re-embark. But that was impossible. The commandos were now pinned down. Although the landing craft had managed to return to the beach to pick up the survivors, none of the commandos arrived. Eventually, after waiting as long as they dared, the crews of the landing craft left. Unbeknown to them at the time, the commandos they had come to pick up were still pinned down. Those commandos that were still alive were unaware that there was now no chance of getting away. Although some did make a break across open ground in an attempt to reach the beach, many were cut down. Those that did reach the beach arrived to find their only chance of escape had gone; only burnt-out landing craft were there waiting for them. With no option, Osmond surrendered his men to the surrounding forces. Although 3 Commando’s raid had been disastrous, their colleagues in 4 Commando had been more fortunate. They had set sail from Southampton in the landing ship HMS Prince Albert and although they had heard 3’s mid-Channel encounter a few miles to the east, their crossing had been uneventful. Having then transferred to their landing craft for the assault as planned, the first group of 4’s commandos, led by Mills-Roberts, landed unopposed on Orange-One at around 4.50 am and just before daybreak. They were then able to quickly scale the cliffs and take up their positions, where they were to wait until 6.15 am before commencing their barrage of fire against the battery from the front – the second group were to commence their main assault from the rear fifteen minutes later. Meanwhile, Lovat’s second group had not been quite so lucky. Their landing was met by heavy machine-gun fire from two pillboxes overlooking the beach. Calling for support from the mobile reserve section of A Troop to deal with the enemy positions, Lovat quickly led his two troops off the beach and towards the rear of the battery, where they took up their positions ready for the assault. Behind him, the commandos of A Troop soon dealt with the pillboxes and quickly made their way towards the first group, where they were to join up with the rest of their troop. For Mills-Roberts and the commandos of the first group, the peace and quiet of the early summer morning was suddenly shattered and the ground shook when the battery unexpectedly opened fire. The convoy carrying the main assaulting troops had been spotted a few miles away and the battery was now engaging the ships. Mills-Roberts decided to wait no longer. Although it was not yet time he decided to engage the battery immediately. Mortars, Brens and rifle fire – everything the commandos had – rained down on the battery; it was the first the Germans knew that the commandos were even there. A short distance away, Lovat and his group heard the firing. They were making their way towards their assault positions but the going was tough across heavy ground. Leading F Troop was Captain Roger Pettiward. One of 4 Commandos’ true characters, Pettiward was a complete gentleman by nature. From a privileged background, and educated at Eton, he had been an adventurous and well-travelled artist before the war, achieving much fame as the cartoonist Paul Crum. Alongside him was his second-in-command, Lieutenant John MacDonald, and 24-year-old Major Pat Porteous, the son of an army brigadier and a former artillery officer, who was acting as the liaison officer between the two assault groups carrying out the attack. As the commandos of F Troop moved quickly between cottages and an orchard towards their assault position, they were suddenly caught by a heavy burst of enemy machine-gun fire. Pettiward and MacDonald were both killed instantly. As Porteous continued the advance towards the guns he was hit, the bullet passing through his palm and entering his upper arm. Undaunted, he continued until he reached his assailant, disarming him and then killing him with his own bayonet; thereby saving the life of one of the sergeants on whom the German had now turned. With Pettiward and MacDonald dead, and the troop sergeant major wounded, Porteous took command. Without hesitation, and in the face of overwhelming enemy fire, he dashed across the open ground to take command of the remaining commandos of F Troop. Rallying them, he then led them to their forming-up position where they fixed bayonets ready for the assault. A pre-planned strike by Allied fighters arrived exactly on time to strafe the battery. It was now 6.30 am and Lovat signalled the assault. The covering fire then ceased and the commandos of the second group attacked. 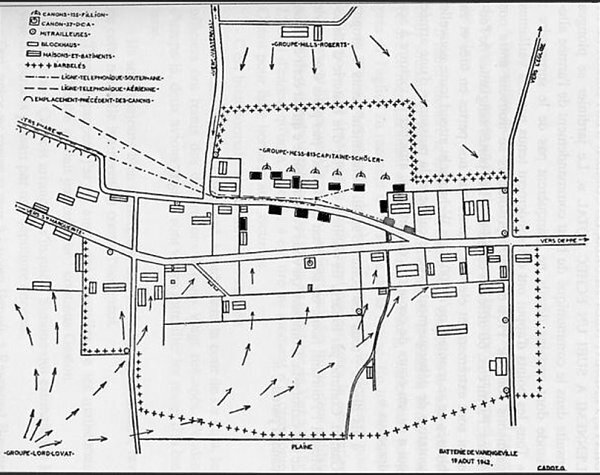 While Captain Gordon Webb led B Troop towards their objective of the battery’s buildings, the wounded Porteous led F Troop’s charge towards the guns, now less than a hundred yards away. Porteous was immediately wounded for a second time, shot through the thigh, but despite his wounds he continued to lead the men straight to the guns. He was one of the first to reach their final objective, but he was then hit again and finally collapsed from the loss of blood just as the last of the guns was captured. His most gallant conduct, brilliant leadership and tenacious devotion to duty was supplementary to the role he had been given for the assault and was an inspiration to his unit. It was later announced that Pat Porteous was to be awarded the Victoria Cross, one of three VCs to be won during that day. 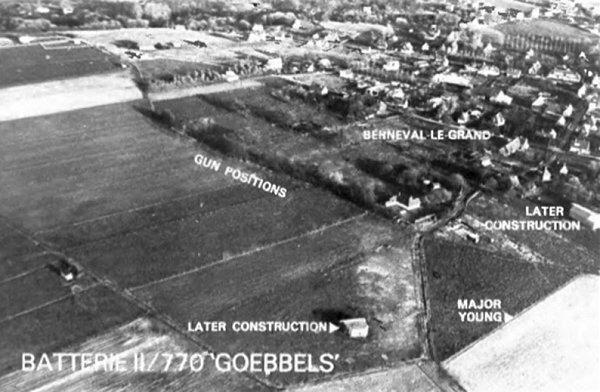 Demolitions experts then destroyed the six guns with explosive charges while the commandos of B Troop searched the battery buildings and gathered anything of interest for intelligence. The commandos had been ashore for two hours and it was now time to leave. Carrying their wounded, the commandos withdrew to Orange-One where they were evacuated from the beach by landing craft under the cover of a smokescreen. It was still only 8.30 am. Then, having crossed the Channel without incident, apart from some ineffective enemy fire on leaving the beach, the men of 4 Commando arrived at Newhaven shortly before 6.00 pm. It had been a very long day. 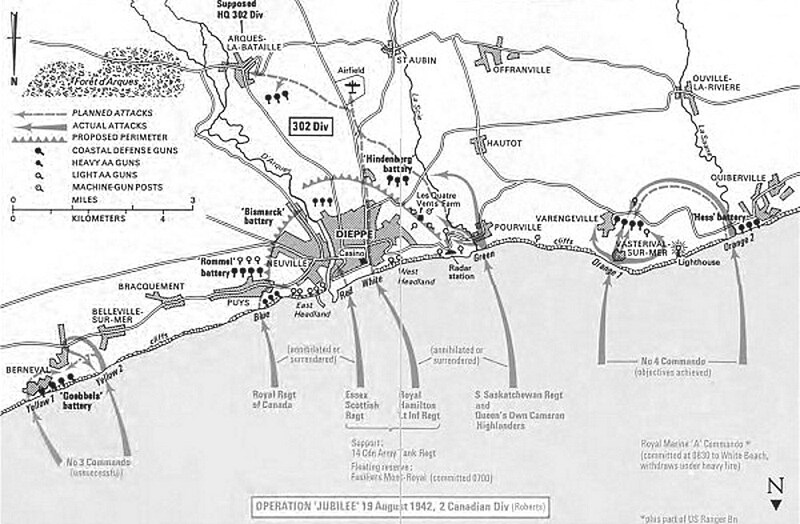 As for the main assault on Dieppe by the Canadians, it was a total failure. The naval bombardment had not supressed the enemy defences, the tanks were unable to advance over the shingle beach and the infantry had suffered heavy casualties. Of the main assault force of 6,000 men, over 1,000 were killed and more than 2,000 were captured and taken as prisoners of war (a total casualty figure of some 60 per cent of the attacking force). Naval losses were also severe, with more than 500 casualties, plus the loss of a destroyer and over 30 landing craft. Allied losses in the air were also significant, with around a hundred aircraft lost, more than on any other day of the war. Furthermore, none of the objectives had been met: the assault by 4 Commando on the Hess Battery at Varengeville had been the only success of the whole operation. Even so, 45 commandos had not returned, 17 of whom had been killed, although German casualties were estimated to be around 150. The assault by 4 Commando was later described as ‘a classic example of the use of well-trained troops and a thoroughness in planning, training and execution.’ For his leadership of the raid, Lord Lovat was awarded the DSO and his second-in-command, Major Derek Mills-Roberts, was awarded an MC, as was Captain Gordon Webb. The men of 3 Commando had also fought with courage, aggression, resilience and dogged determination at Dieppe, but the fight had proved costly, with 140 killed, wounded or taken as prisoners of war; the majority of whom had been killed or captured trying to make it back to the beach. Amongst those killed was 22-year-old Lieutenant Edward Loustalot, a US Ranger attached to 3 Commando. He was the first American to be killed on European soil during the war and one of three rangers killed at Dieppe; Loustalot had been cut down by enemy crossfire while attacking a machine-gun post at the top of the cliff. For his courage and leadership of the eighteen commandos of 3 Commando, who had landed in the single landing craft to the west of Yellow-Two and had then harassed the battery for some three hours before withdrawing safely back to England, Peter Young was awarded the DSO. His action was later described by Vice Admiral John Hughes-Hallett, the naval commander of Jubilee, as perhaps the most outstanding action of the whole operation. Although the raid had ended up in a disastrous loss of life, the events at Dieppe would influence Allied planning for later landings in North Africa, Sicily and, ultimately, in Normandy on D-Day. The losses at Dieppe were claimed to be a necessary evil and Mountbatten later justified the raid by arguing that lessons learned were put to good use later in the war: stating that the success at Normandy was won on the beaches of Dieppe, and every life lost at Dieppe in 1942 spared at least ten more in Normandy in 1944. Churchill also claimed that the results of the Dieppe raid fully justified the heavy loss. To others, however, especially the Canadians, it was, and remains, a major disaster. This entry was posted in Artillery, British, German Units, Operations, SpecForce by MSW. Bookmark the permalink.